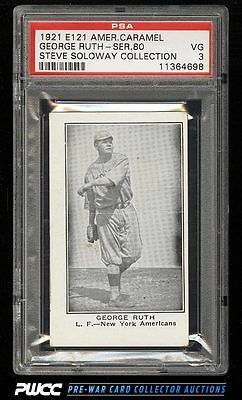 Among the most desired early Ruth cards in the entire hobby. Exceptionally elusive variation on top of the sheer popularity of the E121 which ranks among the finest examples in the hobby and is virtually impossible to improve upon. The offered '3' displays outstanding focus, mostly square corners and crisp edges for the assessment. A must have for the serious Ruth collector. One of nearly 20,000 cards, lots, and sets up for bid in our 7th Auction of 2016. Click on the link above to view the other PWCC auction lots.